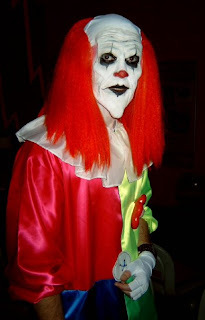 Meet Scary Clown, aka my husband in his favourite fancy dress costume of all time! This was his outfit of choice on a adult party weekend at Butlins several years ago. I tried to disown him for the night but as much as we tried we couldn't lose him even in a packed nightclub, you could always tell where he was by the screams coming from random people as they ran away! He's going to get off lightly in my opinion there are few big things I want doing around the apartment but I certainly don't intend to do all the household / childcare jobs on my own now he's here full time too! We do seem to always fall into the same jobs though - emptying bins, cleaning windows and ironing are always down to Aaron, Mopping and sweeping is usually a joint effort, but there is one thing that is always completely down to me...... Aaron does not do washing up.....EVER. October is probably my favourite month now I live in Cyprus, it used to be July or August in the UK, working on the principle that there was the most chance of a bit of summer then. The temperature here slowly starts to cool at this time of year, and after the long hot summer (made much longer and hotter by being big and pregnant!) its a welcome relief! Last year we made an 'Autumn Tree' and this year my 'crafty' friend and I decided to make some Autumn wreaths with the kids after seeing 'The Boy' making one. I'm all for simplicity when it comes to crafts and this certainly fitted the bill! Cardboard circles, crayons, glue, ribbon and different coloured paper leaves was all we needed, along with the patience to explain why we there weren't just green leaves. I've been trying to get back on track this week so I've been making an effort to plan all meals to Slimming World friendly and cooking enough to eat them for the following days lunch where possible. We've had home-made meatballs and spaghetti, omelette and chips and one of my current favourites, Spaghetti Carbonara. It's quick and easy and doesn't taste like a 'Slimming' dinner. Beat an egg, stir in some 'very low fat fromage frais' and chopped herbs. 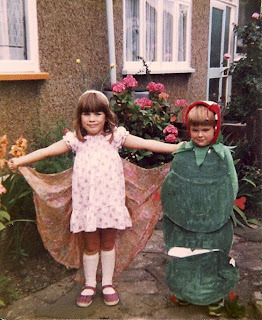 It was our playschools end of year show, I was the butterfly and all I had to do was crawl out of the cocoon (a table covered in brown paper) after my friend the hungry caterpillar had crawled into the other side. I was very shy anyway and wasn't very happy about doing it probably but unfortunately, I hit my head on the table as I came out - I can still remember the pain! I saw my Mum in the audience and ran straight to her crying! No amount of persuasion could get me back on stage, I think in the end my Mum came up too! 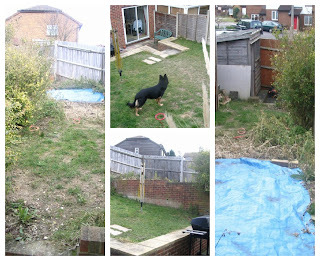 When we moved into our first house together back in 2003 the garden needed a lot of work, so much in fact that we left it for several years while we worked out what we could do to make it better. The problem was a raised section that was separated from the rest by a huge wall that was also on a steep slope and not really big enough to do anything with. It's very hard when following any diet / eating plan to stay on track 100% of the time, the secret is learning how to get back on it, or preferably not veer too far from it in the first place. This hasn't been a 100% week for me, it was my birthday so I knew it was never going to be! Despite the fact I always joke that cake is syn free on your birthday (well, it should be!) celebrations inevitably mean the temptation to eat and drink 'bad' things. As often happens I celebrated my birthday over two days, my actual birthday and then a meal out the following day as it was the weekend. From a Slimming World point of view it could have been worse though. I kept to the plan on the actual day apart from a big chunk of birthday cake and on the day of the meal I kept to it all day, until we reached the restaurant that is! This week's Gallery theme is old. 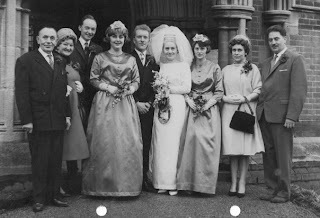 When my Mother in law got married she spent £5 on her bridal veil........ Five WHOLE pounds. Her Mum was not happy and thought it was far too much to spend on something she would just wear once. I think it was money well spent, don't you? I'd heard many English parents here in Cyprus worry about their child's English and end up getting private tuition for them as they progress through school to keep them up to speed in case they have to go back to England to study at any point. It concerned me that there was going to be an extra thing to worry about, but I thought with the wealth of information and resources available surely we'd be able to do it ourselves? The best bouncy castle in the world! 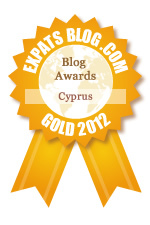 Apart from the beach and pools there are very few good places to take little ones here in Cyprus. Parks are very few and far between and are usually not all that good and play areas are often a little bit worse for wear - usually sun-damaged and sometimes the toys can be quite dangerous. 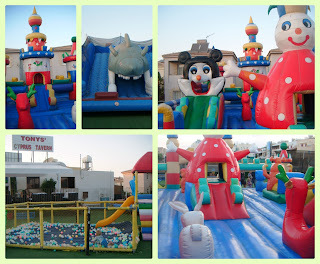 So we were quite excited this year when an established restaurant in nearby Kapparis opened up a play area. Initially we were disappointed that it didn't open until 6pm but realised it would be just too hot to go there during the day. 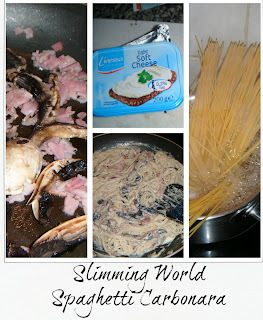 If I had to pick one product that helped me the most with Slimming World it would have to be Batchelors 'Pasta & Sauce. Pre SW (and pre-children) I used to eat at lot of ready meals and processed food, 'Pasta & Sauce' being one of them. When I started the plan I was very happy to find they were 'free' on Green days (or very low in syns for some flavours). Although I started cooking most meals from scratch I found these to be a life saver many times and always made sure I had several packet in the cupboard. Not only were they quick and easy to make I actually really enjoyed them unlike most other SW friendly 'easy' foods. Handily they are also in the shops out here and they are a sensible price unlike many other imports. After the hugely painful but overall brilliant birth of Loukas I was taken back to the ward. It had two beds but at that point I had it all to myself, with TV and free wi-fi plus a great view I was very comfortable. The midwives took Louka for a few hours so I could rest which was most appreciate. 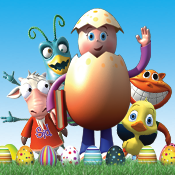 They loved this 'big baby' with his head of gorgeous blonde hair, something which must be very unusual for them. They often popped in for no apparent reason during my stay just to see him! I was quite happy in the hospital unlike when I had Leo where I couldn't wait to get out, although this time I was appreciating the time to rest before starting the new chapter of my life with two children. Aaron came to see me after work and to meet his second son. He stayed just a short while so he could get home relive my parents and put Leo to bed. My parents then popped in afterwards as I had not felt up to seeing Leo right away, preferring to be able to greet him properly when I did. After checking my blood pressure and monitoring baby's heartbeat I was hooked up to the drip to start the contractions off at 10.30am. 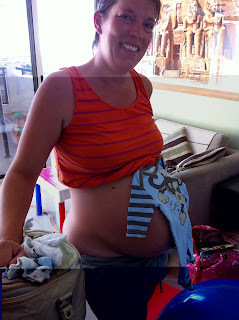 It was a low dose to begin with so the contractions started quickly but were mild and caused me no problems. Claire was great at keeping me moving, something I didn't do at all with Leo. We walked up and down the ward corridor chatting about all kinds of random stuff while I kept tangling myself up with my drip! She had me bouncing on the birth ball and doing squats, all things I wouldn't have been doing without her encouragement. The midwives were great at letting me keep moving, something they are not generally known for after induction, and they only popped in now and again just to monitor me. Loukas is now 6 weeks old and I've finally finished writing my birth story - it's quite long so I've split it into several posts, the rest will be coming up over the next few days. Although I didn't have a terrible birth with Leo it wasn't the best fun I'd ever had (you can read the story here) 12 hours of labour with gas & air, pethidine ventouse delivery followed by stitches. I felt like I'd been run over by a truck afterwards and was very uncomfortable for weeks. My second birth was very different, It's taken me an age to write but here is my story, I tried (and failed) to keep it short and sweet so will split it into several posts just in case I accidentally break the interweb or something! Last year Leo and I went to the 3rd birthday party of my friend's daughter at our local soft play place. 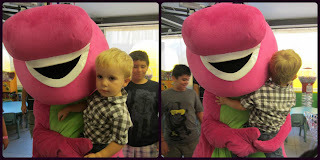 As part of the party package the kids had a visit from Barney the Dinosaur. I wondered how Leo would react to him, he watched Barney regularly on TV (I can't stand the annoying purple thing myself but there is little else on Arabic TV!) but I thought it might scare him in real life. 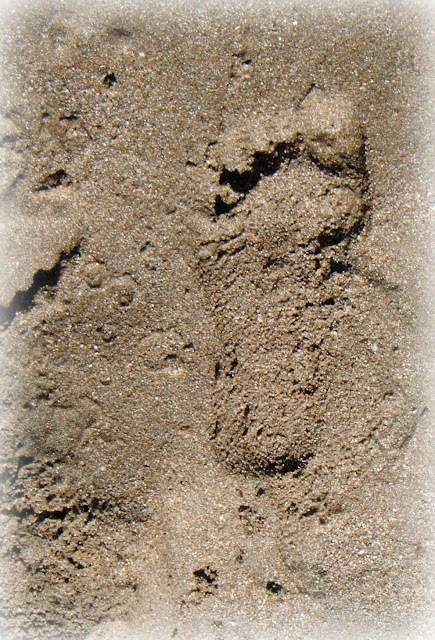 I asked him if he wanted to go over and see him and he nodded at me, eyes wide with amazement. 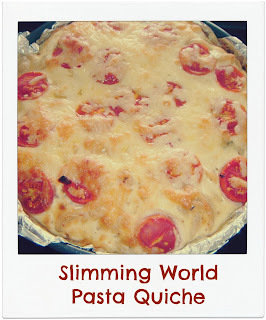 Each week along with my weigh in post I'll be sharing some aspect of my current or previous Slimming World journey, recipes, tips or just my random thoughts about it. 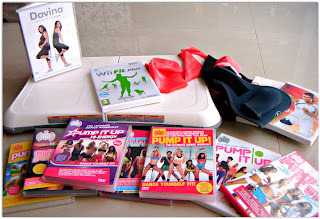 Hopefully it might be of interest to some of you, but if nothing else it will help me stay on track! I lost 4 lb - a very good start I think! When I started Slimming World back in 2006 I was pleased to hear you didn't HAVE to exercise but it didn't take me long to realise that it would make a huge difference to my weight loss and that I would actually start to get fit for probably the first time in my life! 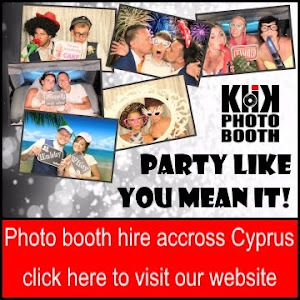 I am a foreigner like you and had very similar concerns to yourself about giving birth in Cyprus not so long ago; I thought I will share my experience. Leo has been at his new 'Big school' for 3 weeks already, he's enjoying it and is now going off each morning without a fuss which is brilliant! Each day when I pick him up he's so pleased to see me but comes out happy and full of beans telling me all about his day. I've been making sure when I collect him that I'm not late, but also trying not to be too early (I am usually too early for most things!) as I didn't want him to expect me to be the first Mum in each day. This usually means I am sat in the car for a while or I sneak into the school and try and catch a glimpse of him before he sees me. It amazes me each time I do to see him in this new environment getting on with it and looking so grown up.